A clip-on badge ID holder from Wipaq will withstand years of use. We have one of the widest selections of badge holders and clips anywhere. Badge holders could be a Clear Badge holder, Rigid ID holder or hard pouches. Badge holders are made of polycarbonate too. 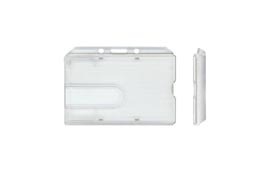 A Rigid Card Holder usually comes with a thumb notch so that the card could be easily slide out. These Rigid card holders provide a great amount of protection to technology cards like Mifare, smart cards, magnetic stripe cards. These cards remain straight in the rigid ID holder ensuring that there is no bend on the card and hence prevention of damage. In earlier days laminated pouches allowed the consumer to protect a document within a layer of plastic material by process of lamination. It is quite common for people to laminate things such as luggage tags, work ID cards, personal identification cards, library cards, and other documents of importance. Lamination helps to preserve the document and strengthen its reliability. 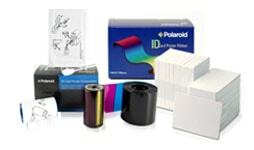 The process requires three things: The laminator, the laminating pouch and the document to be laminated. ID badge holder are size specific. In other words, most laminators require you to use only laminating pouches that are equal to or smaller than the maximum capacity of the machine. Additionally, laminating pouches are rated by their thickness. Thickness measurements for laminating pouches are measured in one "mil" increments. Mil thicknesses commonly sold to the public are between three (thin) and ten mil (thick). As a frame of reference a mil is one-thousandth of an inch, or .001 inches (.025cm); glossy photographic paper, for example, is usually 10 mils thick. Of course, there are thicker laminating pouches, but they are most often used in industrial applications. It is important to ensure that the laminator can accommodate both the thickness and dimensions of the laminating pouch that you intend to use. Keep in mind that you can trim any excess material from the laminating pouch either before or after the laminating process. Many of the work identification cards and driver's licenses that are seen are often laminated in laminating pouches. These pouches may contain embedded holograms to ensure authenticity, while others may include a magnetic strip on the back of the card. Both of these enhancements provide diversity in the pouches and allow employers to create and verify authentic copies of their employee IDs. While magnetic strips can be scanned for information and authentication, holograms are a clear visual sign that a document is real and original. 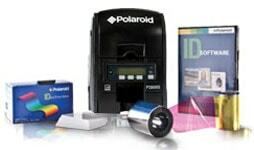 There is virtually no limit to the combination of holograms and magnetic strips that can be embedded into a lamination pouch. At Wipaq Dubai, UAE; we provide free quote estimates for rigid card ID holder supply. 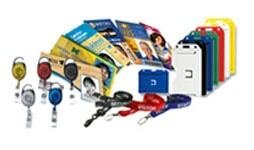 At Wipaq Dubai, UAE; we provide free quote estimates for Badge Holder & Rigid Plastic Pouch. Call us for Badge Holder & Rigid Plastic Pouch Saudi Arabia | Bahrain | Dubai | Oman | Egypt | Kuwait | Turkey | South Africa.